Software development is becoming more wider and diverse as technology changes. Deciding what job-role to fill with respect to income is a bit puzzling for any individual. Here, we'll examine the roles that pay the most in the industry, that is, roles that earn more money than others. It's worthy of note that not all software roles write codes and the complex mathematical computations. 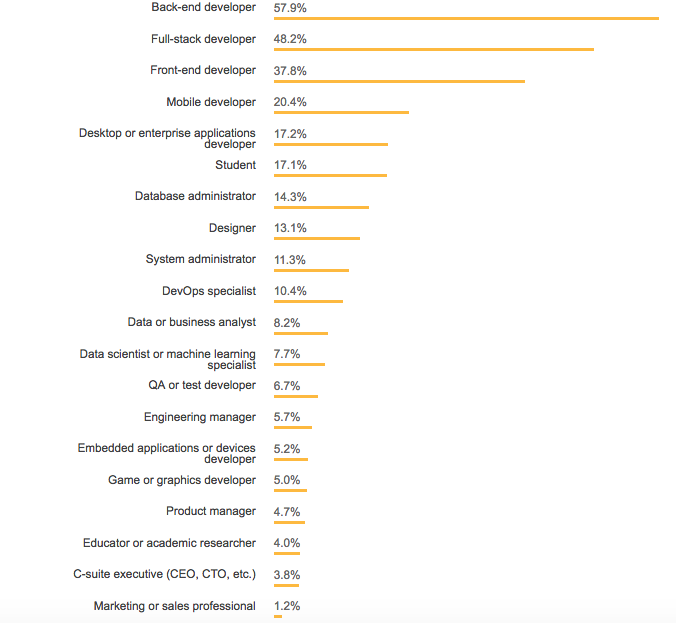 As a matter of fact, research shows that the highest paying roles are more dependent on developer's experience. There are roles that only require the basic understanding of the technology stack and still pay more money than the more difficult roles. In this article, you'll find out how you can earn well working in a software development environment with or without the core coding skills. The report confirmed a noticeable trend that there are more back-end developers globally over the past years. Stack Overflow's survey provides us a salary calculator which we can use to estimate the latest earning of any development field based on different variables. This varies based on Location, Education, Technologies, and Years of experience. By using the calculator, we were able to compile the list below. You should go ahead and try it yourself. As mentioned earlier, the top earning roles in Engineering Manager and Devops Specialist does not require core technical skills. Instead, the earning capability is mostly determined by an individual's experience and quality of projects executed.